There are so many things to celebrate about the Fall season – crisp, cool air; rich colors and fun activities for all. Fall also brings nutrient-rich produce to keep you happy and healthy all season long. These five easy-to-find super foods are not only good for your health, they can be quite comforting! Try all five super foods in this Roasted Butternut Squash Soup and enjoy a great fall comfort food. 1. Apples – The sweet, sometime tart, flavor makes them seem more like a treat, but this fiber and antioxidant-packed food will help boost your immune system while keeping you full and satisfied. 2. 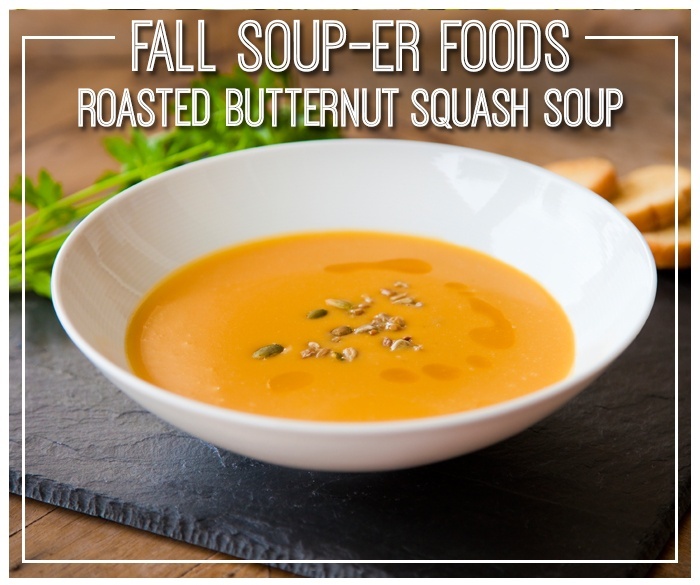 Butternut Squash – The fine texture of butternut squash makes for creamy, slightly sweet soup on it’s own. Butternut Squash is rich in vitamin A and has natural antioxidants. 3. Cauliflower – Cauliflower is the exception to the rule when it comes to avoiding white vegetables. This vegetable is an excellent source of vitamin C and contains phytonutrients that lower cholesterol. 4. Onions – Low in fat and calories, onions are a flavorful component to any dish. Onions contain both manganese and vitamin C, which produce anti-inflammatory actions to relieve cold and flu symptoms. 5. Sweet Potatoes – This versatile food is great grilled, sautéed, baked or roasted! High in vitamin C, sweet potatoes will help you ward off colds and boost immunity to disease. Preheat oven to 375. Add apples, butternut squash, sweet potato and cauliflower to a foil-lined baking sheet. Drizzle with 2 tablespoons of olive oil over the fruits and vegetables, then sprinkle with salt and pepper. Roast for 30-45 minutes, or until a fork can easily cut into a large cube. Add remaining olive oil, garlic, onion, sage and thyme to a 6-quart stockpot and begin to sauté on medium heat. After 3-4 minutes of sautéing, add roasted vegetables, chicken stock and orange juice. Stir to combine and cover. Reduce heat to medium-low and let cook for 20 minutes or until all vegetables are tender. Remove from heat and allow soup to cool for 5-10 minutes. Using an immersion blender, blend soup together in the pot until it’s smooth. Be careful when you’re blending, as the soup will be very hot!